You can get some really good stationery bargains at 'Back to School' sales. 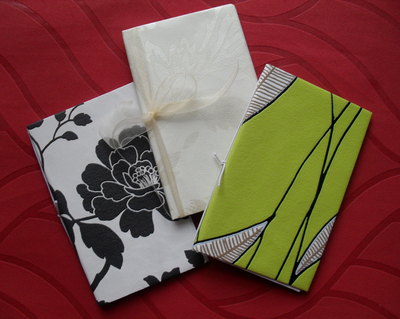 Pretty up some notebooks for yourself or use as low-cost gifts. 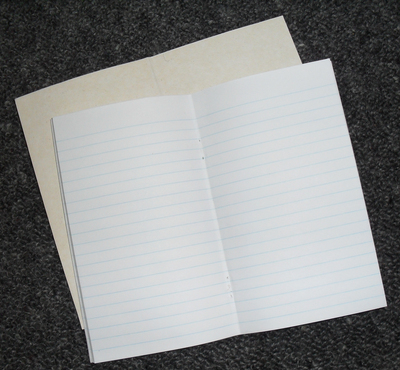 Open the notebook to the middle and remove staples with a blunt kitchen knife. 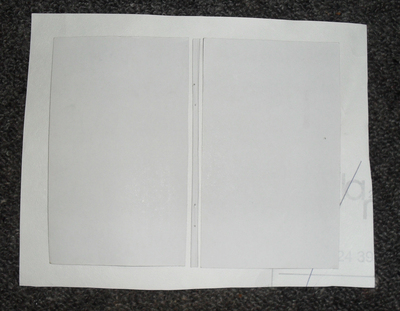 Cut the cover along the 'spine' folds. 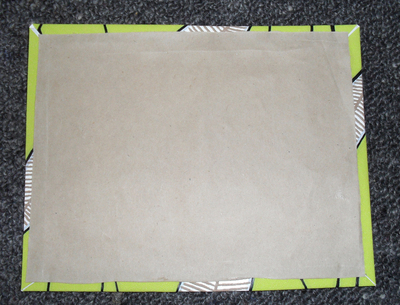 Lay scrap paper face down and glue the cover pieces close together, keeping the top and bottom edges fairly straight. 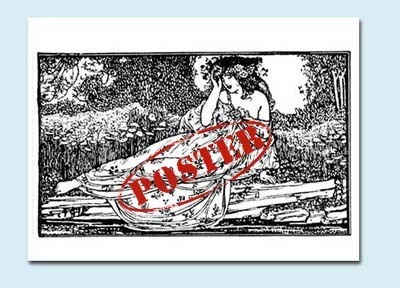 Trim scrap paper about an inch larger than the cover all the way around. Trim corners diagonally. 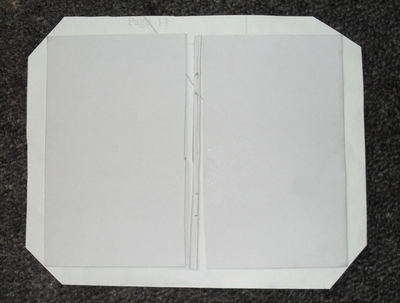 Fold and glue the outer edges of the paper (glue the wrong side of the paper) to the inside of the cover. 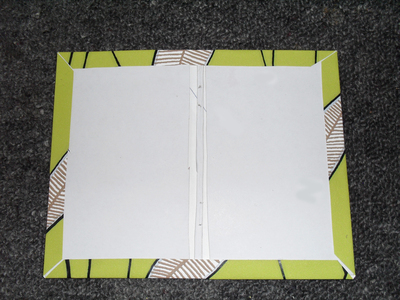 Trim more scrap paper to fit the inside cover, and glue, hiding the edges of the outer cover as shown. 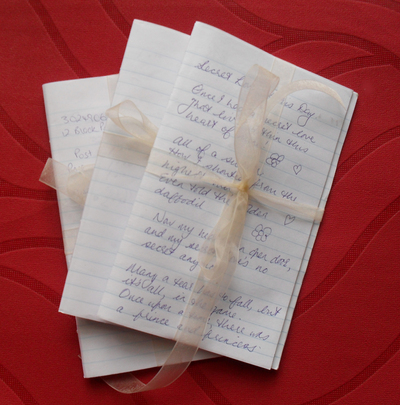 Grab the pages, put them back in the notebook tying them to the cover with a piece of elastic or use rubber bands. When you’ve finished your pages, just whip them out and tie together with a piece of ribbon for storage. Add a gift tag to the finished booklets. Write the date you finished the pages on the gift tag. Pop them in a pretty fabric box. 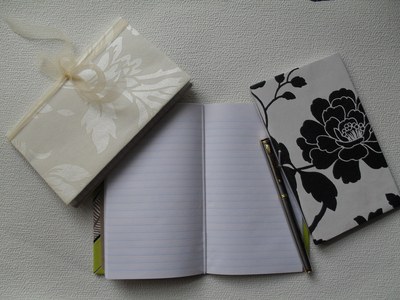 Grab your next notebook, get rid of the staples and pop the pages back into the reuseable cover. Put the ‘new’ card into your craft stash. Sometimes you get big, bold patterned pages in your scrap paper pads, that might not suit your layouts – what to do with them? 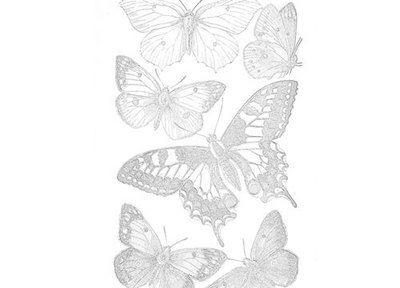 The patterns get covered up and you can’t really see how beautiful some of them are. This project is great for that! Try Kraft paper or brown grocery bags for the inside cover. There is no need to meticulously measure. This project is easier and quicker than you might think. Minimal supplies and maximum impact!